We all know that Thanksgiving about to come which only one day without today. I will be sharing in a post about everything that I'm most thankful for and send my wishes to everyone on the same exact day. Hopefully, everything will be as planned because I might be busy which I may lose the chance of sharing it, but I will make sure to write it before the actual day. 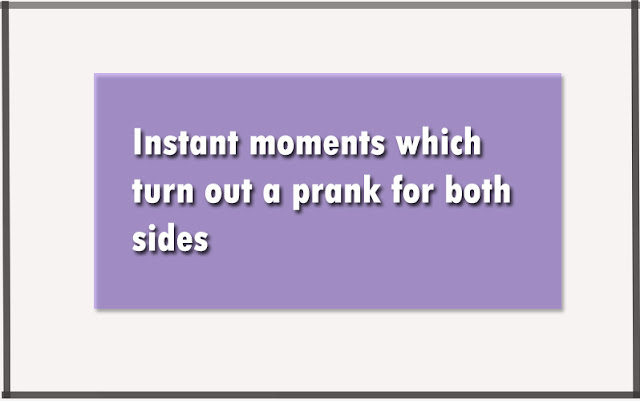 We all get that instant moment which happens accidentally and it scares both sides as a prank haha. At least this is what happened to me before in my lifetime. It would be like a quick funny reaction and laugh because you are in rush for something to get done or somewhere to go to. If you ever wondered about pranking both sides and still be funny, well, you are about read how haha. If you ever had a question in your mind of what I'm writing or what you reading haha. Well, my main purpose is entertainment and laughter, using our moments that happen in our life is something thought would be interesting, also, good idea. However, I'm looking for more stuff as I'm posting and develop how to go through the moment or whatever is that I want to talk about. I hope I'm doing a good job though. The only reason that made me do it is that if we look around the web, we will find a lot of informative blogs which provides information about certain things in life. Entertainment would the least topic everyone would expect and how its done is something else which I'm working on developing a great way. Also, sharing certain things in my life. 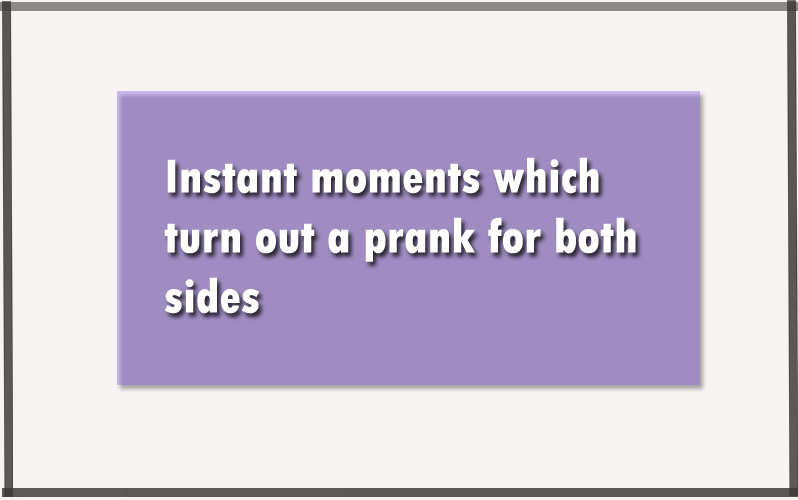 Anyways, this time as I said at the beginning of this post, I will be sharing the funniest instant moments that was a prank to me and whoever was with me during the moment. Thought this would be a good idea to make you laugh because it makes me laugh every time I remember some of it. One of the most famous ones that happened to me and still could happen over and over is what I call 'the blind spot' which means we don't expect at all because we don't see it coming. I'm sure some of you have got this moment, you can share it with us in the comment section if you feel like it. I wonder how it ends up for other people. This happened to me with three of my family members, my older brother, aunt, and my grandma haha. It was in the same sport, but with different reaction and purposes. This is going to be good memories read for me after a while because I would forget it if I don't remember from time to time haha. I will be going through one and just explain reactions for the all of it since it's in the same spot. I was rushing to buy snacks for myself and get back to finish watching the movie, my older brother happens to get in the house as I'm leaving. I was running and he suddenly popped in my face as I opened the door and walk out in a hurry to the outside. He was looking at me like 'what in the world is happening' like it was something serious, but it was just me running in a hurry to get some snacks haha. It was somehow, frightening as it suddenly happened which mean like a scare jump, you know what I'm saying haha. Reactions in this situation can only be from my side because they just walking in and chilling and I am the one who is rushing haha. My grandma, I was called by cousins to get out and hang out with them, nothing happened I stopped as soon as I saw her, but it was a bit scary haha. My aunt, however, I accidentally put my hand on her chest for defense purpose because I had no choice, haha and it was pretty close haha, My brother I just avoid it quickly before I crash into him as I'm leaving out. The next one is with my cousin, we went to buy a drink and got sodas aka Pepsi and we weren't expecting anything to happen but to open it and enjoy it, you know. However, that is not what happened, haha my cousin opened his Pepsi and blew all gas up in the air and I was close to him haha which got us both, but mostly, all of it was on my cousin though haha. I felt bad for my cousin that made me scared to open mine because I don't want that happen to me as well, but it was as bad as his when I opened it. I'm sure every one of us has inflated a balloon, but few of us has this moment when inflating it. This is one of funniest things I did with my cousins haha. It always makes me laugh picturing how he reacted to it. This one would only count the other side's reaction because whoever would be, will always be affected by it the most haha. I know some of the people would use a pump or any tool that could inflate the balloon, but I was using my mouth for that. I always wasn't sure when to stop or if it's enough or not and just keep saying 'little more', This is me when I try to do it. Also, sometimes I get a small size than other people who are doing with me and I go for more. However, I was with two of my cousins having a good time and hanging, chilling together while inflating the balloon. I went too far that it blew at my face haha. Once it popped in my face, it got my cousins scared and they were mad at me for doing that. I was like 'I'm sorry, didn't mean that haha'. It was a really funny reaction from them and it scared me too. I think this will be enough for the day, it was really fun writing this funny stuff and I hope you enjoyed it. Is there anything related to you or something happened to you that could be funny? please share it with us in the comments. I will see you in the next post, till then please stay safe and have a good day and morning. You're so right! 99% of the blogs that I follow teach me something. Which is a wonderful thing and I'm so grateful that there are knowledgeable people out their willing to share with me. But very few entertainment! This was an entertaining read. I can remember one time where my sister tried to prank me because they wouldn't invite me to go swimming with them at their apartment complex. Their swimming pool then was closed so they came over to our complex and it was open but they didn't have the key. They ended up not swimming because we weren't home for them to get the key. So the prank ended up being karma on their end for not inviting me. i found that funny back then. That's funny haha. Well, at least you don't need any revenge now. That is true, well, I think that is wise to give the mind time to chill and belly to enjoy a good laughter after learning and doing some work. Laughter is so important to our health and well-being. There is nothing better than a good belly laugh! I found your vignettes quite amusing, even more so, because you were equally entertained by them. Keep up the laughter in your heart. I've always been a prankster so I really enjoyed reading this post. They say laughter adds years to your life and I believe that. Scare jumps are one of the funny and not so bad reactions. Glad you didn't have anything in your hand that you might drop when it happened. Would have been harder to find funny later. It was both fun and interesting to read your post on this topic. We all have moments like these throughout our lives that we look back on with much joy and laughter. The scenarios that you describe here are honestly things I've never contemplated before. Most of our surprise funnies come with verbal slips in our family. Ha I needed a good laugh! Thanks for sharing and entertaining! That is so funny! Definitely a good prank! I need this laugh, thanks! Lol, I love this cuz for me the tiniest thing and like stupid stuff makes me laugh. Like the part where you were going in and getting snacks but then your brother thought it was something serious LOL. That's me right there. I regards these as memories moment and we should do it once a while. Life is short, we shall get into more fun thing and do something silly and weird and make everyone laugh about it. Wow, this sounds like a funny experience for all of you. I have a cousin who always doing things like this and sometimes I did cried because of his pranks. It happens to us every time we have a gathering or even in our family bonding my brother always do a prank that sometimes makes me cry! So funny! There is nothing better than an open huge laugh! Thanks for sharing and entertaining! Haha. I am not that type of person who will pull of pranks but I do enjoy a good laugh! The exploding Pepsi! A true prank classic... In our family, we LOVE playing jokes on each other and have certainly done that one and many others. Fun read! I can’t say that I’m a prankster, but I definitely love to see someone pull off a good prank. Just not if it is on me haha! Its so funny and having a joke or to be entertained is the best to stress out when you are so tired. Scare jumps are one of the funny and not so bad reactions. And I must say this was an interesting read. I'm not much of a prankster, but definitely a good target! My family members love to make me jump!